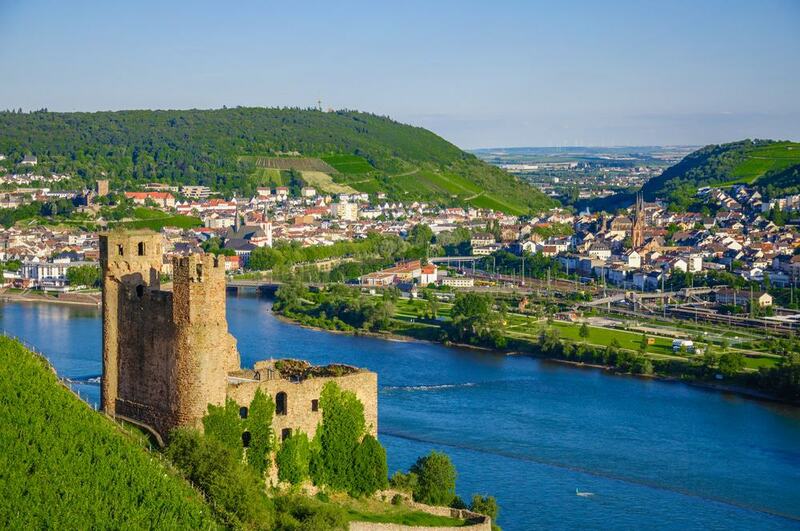 In the Rhine Gorge, Rüdesheim am Rhein is a wine-making town under lofty Riesling vineyards. The landscapes are full of drama, where the high gorge walls plunge to the broad, island-studded river. And guarding the banks are Medieval castles inscribed in UNESCO’s Upper Middle Rhine Valley World Heritage Site. 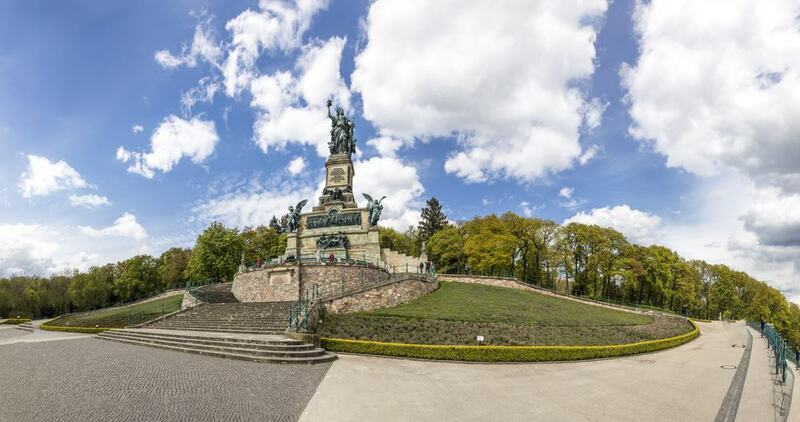 This part of the Rhine, not far from the Lorelei Rock, has long had a special place in German hearts: In the 1870s it was chosen for a magisterial monument to German unification and victory in the Franco-Prussian War. You can walk up to the Niederwald Monument through vines and beech forest, or catch a cable car for views of the Rheingau you won’t soon forget. Up on the namesake hill the Niederwald Monument arrived in the wake of the German defeat of France in the Franco-PrussianWar in 1871. Planning began as soon was the war was over, and it would be more than a decade before this immense celebration of unification would be unveiled, in 1883. High on a pedestal and visible from some distance is the allegorical figure of Germania, on her throne and raising the Holy Roman crown in her right hand, and holding the Imperial Sword in her left. Beneath her, at the top of a twin staircase is a relief of Kaiser Wilhelm I on horseback along with military leaders, soldiers and members of the nobility. On four stone panels are the lyrics to the “Wacht am Rhein” (Guard on the Rhine), a patriotic song from the mid-19th century. 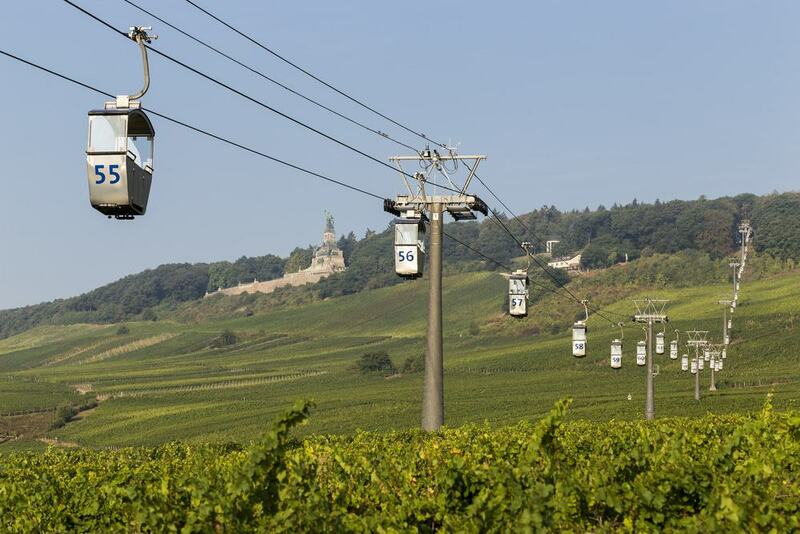 You can walk, but the easiest way to get to the monument is to catch the cable car from Oberstraße for a 15-minute ride over the old town and the vineyards beside the Rhine. 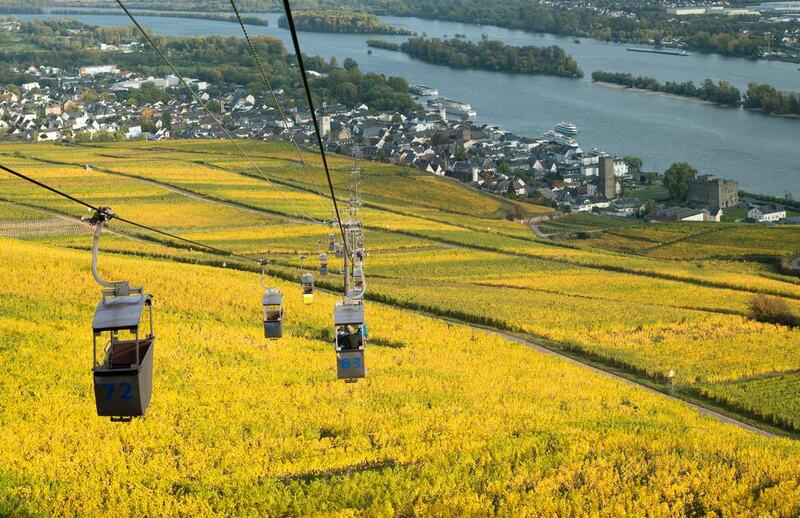 On the way in these open-air, two-seater gondolas there are dreamy views over the Rhine and the string of narrow, wooded islands in the river in front of Rüdesheim. In the summer you could make a special night-time journey to see the moon reflected in the river, while there’s also a restaurant at the upper station giving you an excuse to spend some more time under the spell of the Rhine Gorge’s scenery. Automatic music instruments in many shapes and forms are the stars of the show at this whimsical museum. These date from the 18th century to the 20th century and range from music boxes to organs on wheels, to a small orchestra of 15 instruments. Whether they’re manually operated, charged with a winding key or electrical, the intricacy of these instruments almost beggars belief. You’ll get some idea of how they were manufactured, viewing the equipment required to make organ pipes, as well as their individual components like music rolls, perforated disks and sheet music on cardboard. 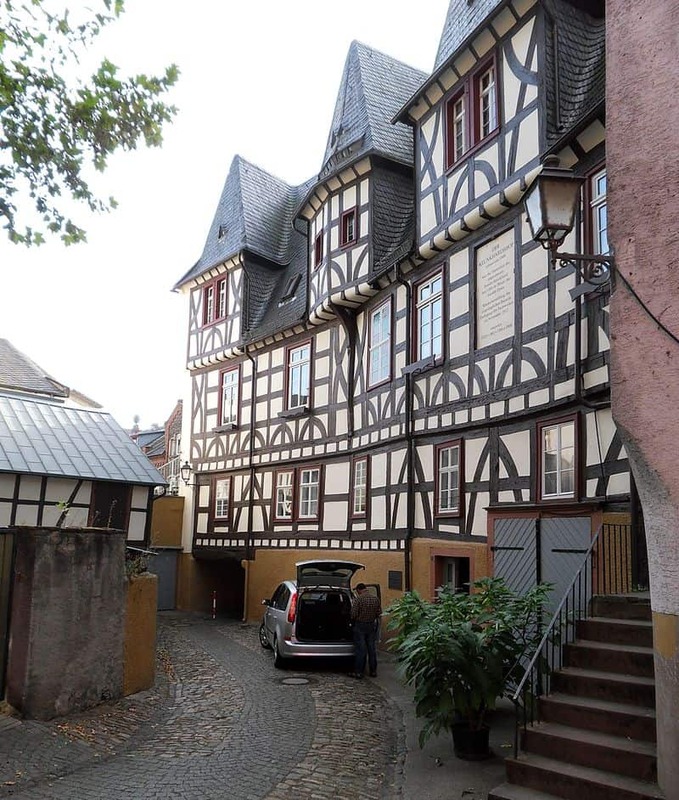 Only two metres wide and 144 metres long, Drosselgasse is the alley along which Rüdesheim’s boat-owners would haul their equipment and goods from the riverside up to the old town. Perpendicular to the Rhine, it is one of the six parallel streets rolling down the slope from Oberstraße. When it was first mentioned in the 15th century Drosselgasse was a quarter for sailors, who would carry their oars, sails and rigging back to their apartments through narrow passageways, and leave their stripped boats moored on the water. Nowadays the street is quaint as can be, lined with half-timbered houses for souvenir shops, artisan specialty shops and wine taverns often wreathed with vines. Included in the Upper Middle Rhine Valley World UNESCO World Heritage Site, Eibingen Abbey still has a community of Benedictine nuns. Apart from during the 19th century, when the monasteries were dissolved, the nuns have been here since the abbey was founded by Hildegard of Bingen in 1165. She was a real polymath, as a writer, composer, philosopher and early natural scientist. Her story is told in the abbey church’s frescoes, painted in the style of the Beuron Art School in the 19th century. 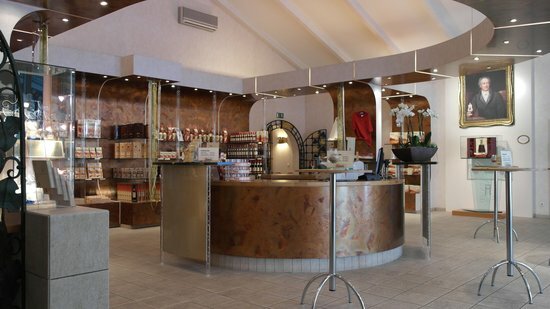 The nuns run a vineyard and sell the wine alongside other artisanal items at the abbey’s shop. 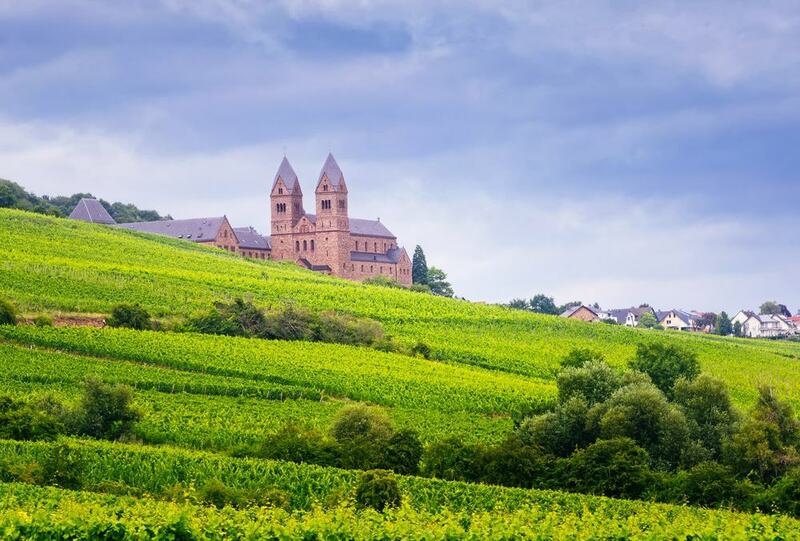 In the evening you can come to hear them singing vespers, while there are also concerts at the abbey for the Rheingau Music Festival in the summer. Originating in the 11th and 12th centuries, Brömserburg was probably the first of the many strongholds that now make up the Upper Middle Rhine World Heritage Site. The castle was in the hands of the Archbishops of Mainz from its inception through to the 18th century. And it has come through in good condition, apart from losing its southeastern wing to an attack by the Duke of Longueville in the Thirty Years’ War in 1640. Brömserburg has been in the town’s hands since the Second World War and has a wine museum charting the history of production in the Rhine Gorge. There are ancient amphorae, barrels, wine presses, historic bottles and glasses, all explained via a multi-lingual audio-guide. The Asbach brandy label dates to 1892 when the Cologne native Hugo Asbach brought the secrets of brandy distillation back from a trip to Cognac in France. In those days, Asbach brandy was known as “Rüdesheim Cognac”, before Hugo Asbach came up with the German word “Weinbrand” after “Cognac” could only be applied to French products. The visitor centre in Rüdesheim screens a movie telling you everything you need to know about the company. You can also go on a whirlwind tour of the distillery to view the century-old stills and fermentation vats, and taste some brandy for a small fee. If this meets your fancy, call in at the shop, selling Asbach’s award-winning Privatbrand, aged eight years. The village of Assmannshausen around the bend on the Rhine, was incorporated into Rüdesheim in 1977. You may already know the name from the local red wine, made from Pinot Noir grapes. A chairlift will carry you from the riverside up to Jagdschloss Niederwald, a former hunting lodge, now a hotel bordering a wildlife reserve. On the way up and at the upper station you can contemplate the high right bank of the Rhine and look down at Assmannshausen, which is packed tightly into the fold of an adjoining valley. A favourite excursion is to hike through forest for 30 minutes to reach the Niederwald Monument on the way back to Rüdesheim. On the namesake side-street leading away from St. Jakobus church is one of the oldest and most photogenic half-timbered houses in the town. Klunkhardshof, with a slightly concave facade, was built for the Klunkhard merchant family in the middle of the 15th century and is one of the best stops on a walking tour of the city. The three-storey house has a large inscription summing up its history on the first floor and has been in the same family since 1906. 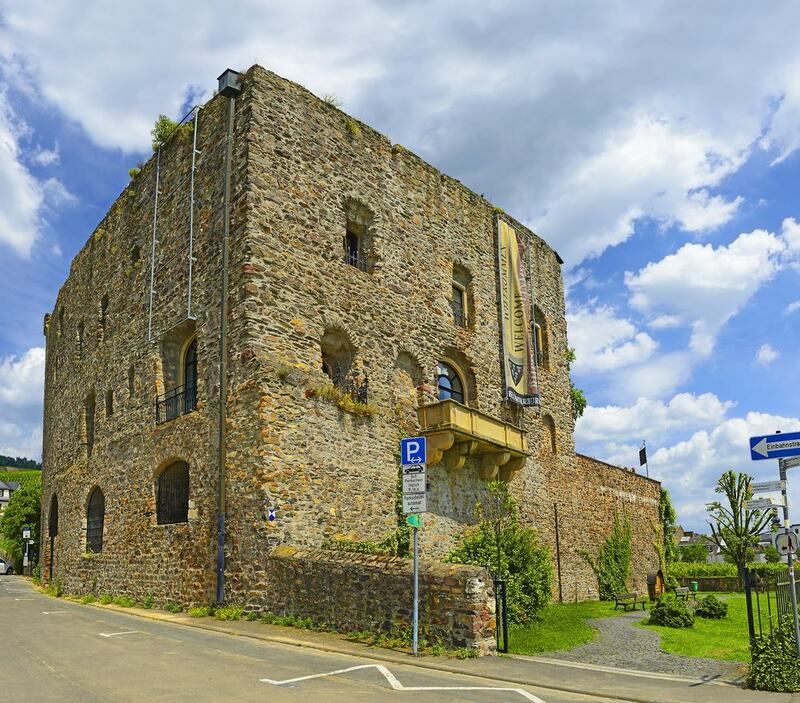 Walkers trailing through the vineyard path between Rüdesheim and Assmannhausen will be met by this Medieval castle ruin on the steep hillside. The origins of the building go back to the Dark Ages, while the current architecture is from the early 13th century. Burg Ehrenfels was ordered by the Archbishop of Mainz as a customs station and a bulwark against the hostile Counts Palatine of the Rhine. The castle was damaged in the Thirty Years’ War and then partially demolished by the French in the Nine Years’ War at the end of the 17th century. Since then it has been allowed to deteriorate, though the two 30-metre towers of its shield wall are in excellent condition. Across the water on a river island, the Binger Mäuseturm (Mouse Tower) is from the old customs station and was restored in the mid-19th century. The Romans were the first to make the most of the Rhine Gorge’s supreme wine-growing conditions 1,900 years ago. The beverage is so integral to Rüdesheim’s past that wine glasses have been recovered from graves in the city from the Early Middle Ages. 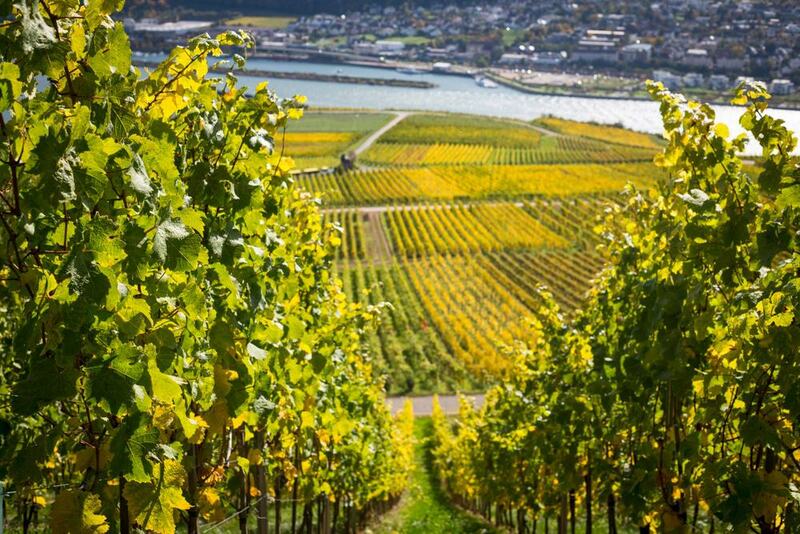 The Rhine’s great breadth here reflects the sunlight onto the south-facing slopes, where rows of Riesling vines are nourished by more than 1,640 hours of sun a year. The soil on this 38-kilometre stretch of the Rhine is incredibly diverse (slate, sandstone, quartzite), creating nuances in flavour from one vineyard to the next. Rüdesheim is devoted to Riesling, which flows at the many cellars and wine taverns in the town. And mid-August is the time for the annual Weinfest, taking place under the plane trees on the market square. This Classical temple in the English landscape park may be the best of all the vantage points at the Niederwald. One person who would agree was Johann Wolfgang von Goethe who looked across the Rhine Gorge from this exact place on 3 September 1814. From then on the temple, built in 1790, became known as the Goethe-Tempel. The original was destroyed in the Second World War but rebuilt soon after, with seven Doric columns around a rotunda. 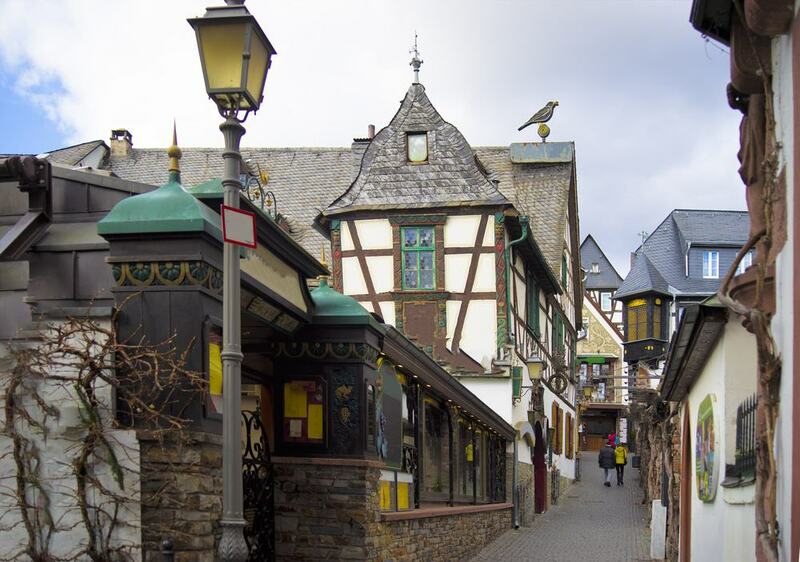 A stroll around Rüdesheim will be sound-tracked by chiming bells on the stroke of hour and half-hour. On Drosselgasse there are 14 bells on the tower of the Rüdesheimer Schloss hotel and restaurant, playing tunes like Die Lorelei (more on that later) every hour and with wooden automatons representing each of Rüdesheim’s four great wine vintages in the 20th century. Then on the facade of Siegfried’s Mechanical Music Cabinet are bells fashioned from Meissen porcelain that ring every half-hour, beginning at 09:30. 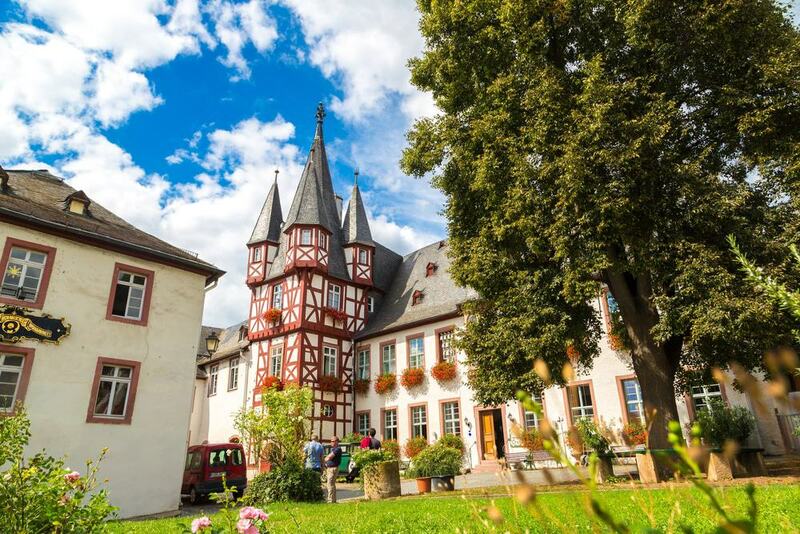 In the summer the Rheingau is a highway for tourist cruises, and in this season you can pick from three different companies four your voyage: Bingen-Rüdesheim Riverboat Tours, Rössler Line Riverboat Tours and KD Köln-Düsseldorfer Deutsche Rheinschiffahrt AG. In the high season they’ll all make at least three departures a day, and the most common destination is the Lorelei, a rock 25 kilometres down the Rhine and steeped in legend. Romantic poets like Heinrich Heine and Eichendorff waxed lyrical about this 132-metre colossus, while Clara Schumann (adapting the Heine poem), Felix Mendelssohn and Johann Strauss I all composed music in homage. On the first Saturday in July there’s a coordinated boat trip and fireworks event on the Rhine. In the Rüdesheim area this runs between the Niederheimbach about 15 kilometres downriver and Brömserburg. 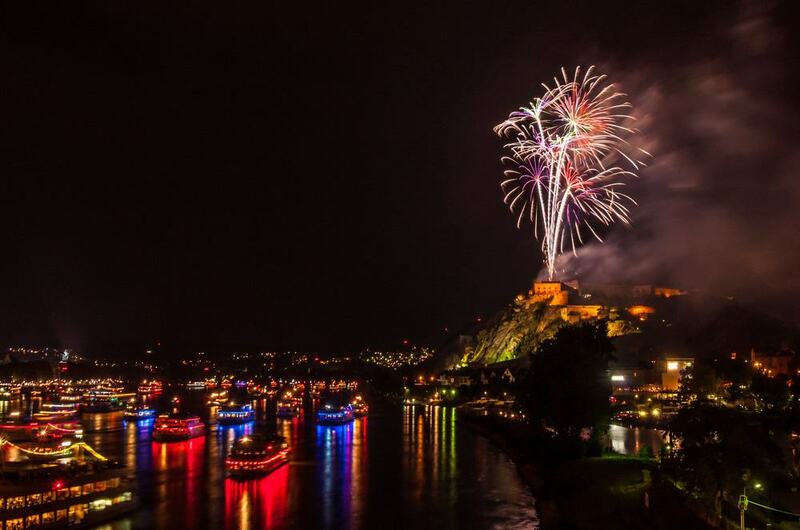 Rhein in Flammen (Rhine in Flames) is as stirring as it sounds: A convoy of 50 cruise ships journeys up the Rhine, and fireworks light up the night sky as the boats pass Burg Ehrenfels and the vineyards of Assmannshausen. The event is now in its fifth decade and there’s about 90 minutes between the first and the last firework.